This is an AWESOME opportunity for you and your friends to listen to dynamic speakers, engaging music, and a time to grow in community and relationship with God. To learn more, check out the promo video below. Please drop off your deposit or send it in to the parish office, attention youth ministry. This will secure your spot. Includes: transportation, hotel lodging, meals and a t-shirt during the conference. Additional funds are needed for our stop on the way to Atlanta for lunch and snacks for the bus ride back to Charlotte on Sunday. If you cancel after May 1st, you are responsible for the entire cost of the conference in the event that we can’t find a replacement. Click here to register for Steubenville Atlanta. If you have any questions, then please contact Adrian Quintero. Lent is an invitation to listen to our lives. As we attune to the rhythm of each unique season, we’ll see that spiritually we experience the pattern of being securely rooted, painfully disoriented, and surprisingly reoriented (`a la Walter Brueggemann). Life transitions that may disorient us include raising children, changing careers or educational endeavors, moving or experiencing an empty nest, grieving the death of a loved one or the loss of a relationship, and healing from physical or emotional trauma. In a blend of lecture and reflection on Scripture and our own lives, this class will guide us through paying attention and orienting ourselves in the midst of life transitions, patiently allowing our pain to transform us, and moving toward an Easter encounter with the Risen Christ! Carla D’Rozario received formation in Spiritual Direction and Ignatian spirituality while earning her M.A. in Pastoral Theology from Loyola Marymount University. Carla’s diverse experience as a retreat guide and lay minister encompasses companioning couples, parents, immigrants, and the aging and dying. Her reflective style of presenting engages both the mind and heart. Cancelled —> Show Us Your Mercy: A Lenten Morning of Reflection has been cancelled. During these times of polarization and division, mercy can seem in short supply. As we journey through Lent, join us for a morning of peaceful and prayerful reflection. Meditating on God’s mercy in the parables of Jesus, participants will examine the healing gift of mercy in their own lives and envision how they might embody God’s mercy to the world. Susan Reynolds, M.T.S., M.Ed., Ph.D. in Theology and Education at Boston College and is currently an Assistant Professor of Catholic Studies at Emory University’s Candler School of Theology in Atlanta, Georgia. She holds a PhD and MTS from Boston College and a MEd and BA from the University of Notre Dame. Her work examines the relationship between theology and culture. She has over a decade of experience in campus, parish, and liturgical music ministry. With Psalms: The School of Prayer, The Great Adventure moves from telling the story to making it personal. While the historical books of the bible recount God’s creative and redemptive acts in history, the Psalms reveal Israel’s response to God’s covenant offer and serve as a model for our response to Him. Indeed, one could say that the historical books tell the “outside” of the story of Israel by giving an historical perspective, while the Psalms tell the “inside” story, which comes from the deeply personal perspective of one who is seeking God. Our Communication with God is enhanced by a deeper understanding of the book of Psalms and of the individual psalms that reside in each of our hearts. Come celebrate the season of Lent through prayer. Register for one of the three sessions offered! Though prayer is one of the essentials of a thriving faith, we often feel as if we’re talking to ourselves—or, worse, as if we’re talking to no one at all. How can something so vital to the Faith be so elusive? Now, with the clear teaching and artistry of the Augustine Institute’s Lectio series, Dr. Tim Gray masterfully uses the discipline of Lectio Divina to show you how to make prayer an effective effort of love and intimacy. In six video sessions, Prayer: Finding Intimacy with God captures the secret to opening our hearts and minds to Scripture as the means to hear from God and then respond in conversation, basking in His presence and resolving to live in and through His love. Middle school youth are invited to bake treats for the Missionaries of the Poor. Bible & Baking is offered on the third Thursday of each month from September to May. While the treats are cooking, we will take some time to explore some Bible stories! Meet in the Family Room in the Parish Center. Adults or High School Volunteers are needed to help facilitate and are asked to arrive 15 minutes early! Click here to register on our Signup Genius page. For any questions, please email Lauren Piercefield. 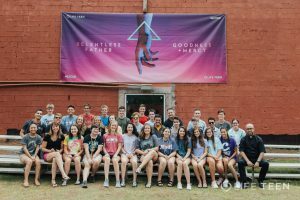 Join other high school youth for an amazing summer experience at LIFE TEEN Summer Camp! $100 non-refundable deposit (part of the overall registration fee) and registration form due by April 15, 2019. After April 15, a $25 late fee will be assessed. If you would like to setup a payment plan or in need of financial consideration, please email Adrian Quintero. WE ARE CURRENTLY SOLD OUT! To be added to the waiting list, please email Adrian Quintero. Click here to complete the registration form for St. Matthew and the Diocese of Charlotte. Additional information will be given once you submit the registration form and payment. Deposit or full payment can be dropped off or mailed to the parish office. We have limited spaces and we will sell out, therefore we can not reserve any spots for camp with registration and deposit. If your deposit is not submitted to the parish office, then your registration is incomplete. We will have a wait list once we are full.